Water and water–containing substances have long been known to heavily absorb terahertz radiation. This property used to make water and some other liquids non transparent for THz rays, which in its turn precluded terahertz imaging technology from being effectively applied in certain fields. 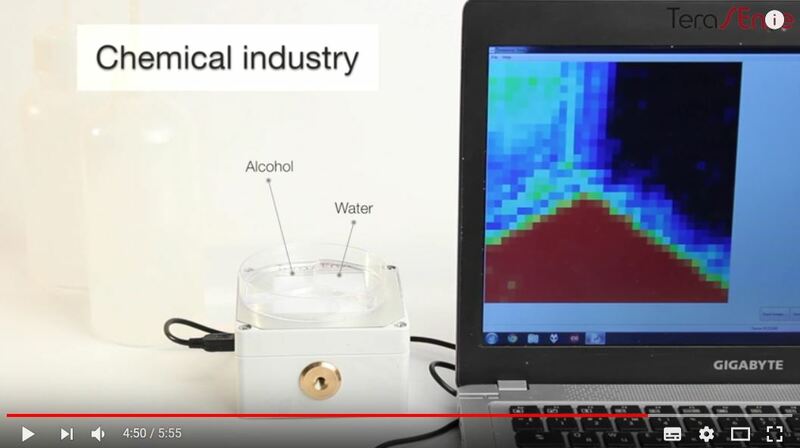 For instance one of our first promotional videos vividly demonstrates that water leaves dark contrast in THz image as opposed to alcohol. However, the researchers at the Tata Institute of Fundamental Research (TIFR), India seemed to have finally managed to break the mold ! The October-2017 issue of Nature Communications journal reported that our counterparts at TIFR, Mumbai in collaboration with other French and Greek scientists recently made a true breakthrough in Terahertz domain by inventing a special THz source generating extraordinary high power radiation. Terasense as a manufacturer of terahertz sources and THz imaging systems based on semiconductor technology is keenly interested in such news and simply could not let this event pass by unnoticed. However, only free electron lasers, which are rather complex and bulky machines, are considered to be able to generate really high-power THz radiation. Such high-power femtosecond lasers can excite terahertz emissions a thousand times stronger from a plasma formed in air under special conditions. As opposed to them compact sources based on semiconductor antennas and special crystals excited by visible/infrared femtosecond laser pulses have very limited energy outputs, typically in the nanojoule level or lower. Due to their high re-absorption properties liquids were traditionally believed to be incapable of giving out significant level of THz emission. But our counterparts at TIFR seemed to prove otherwise. In their tests they irradiated common laboratory liquids like carbon disulphide, dicholorethane, acetone, methanol, and even water, with moderate energy femtosecond laser pulses, ionizing the liquid and forming long plasma channels called filaments. They measured energies as high as 50 microjoules, thousands of times larger than the energies emitted by most existing sources and 10 to 20 times larger than those produced from air. Their careful characterization and systematic study showed that the experimental conditions were simpler than those needed for air. The essence of this model is that the femtosecond laser pulse induces secondary emissions in the liquid which would then combine with the incident laser pulse to produce the observed terahertz radiation. It is hard to overestimate the significance of invention of this compact source, which may well be the most powerful among other tabletop THz sources currently available. TeraSense team, along with the rest of scientific world are poised waiting for the practical applications of this liquid source to transpire, most likely in the fields of material analysis, terahertz nonlinear optics and of course, terahertz imaging , where Terasense takes special interest.